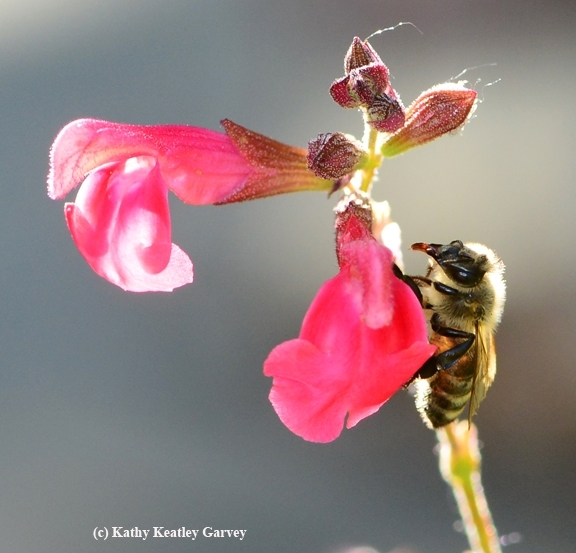 If you have a patch of salvia (sage) growing in your yard, watch for the nectar robbers. 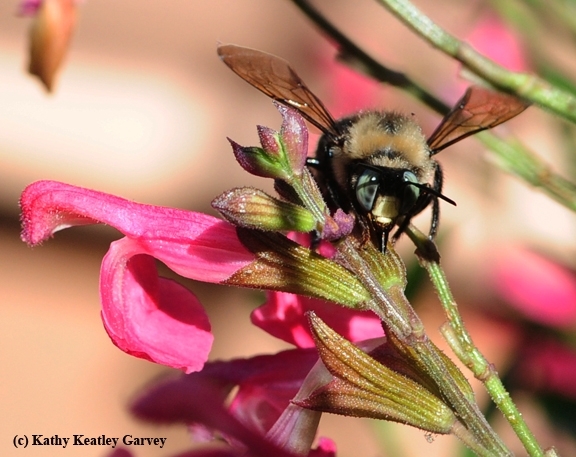 Carpenter bees are among the insects that engage in nectar robbing. 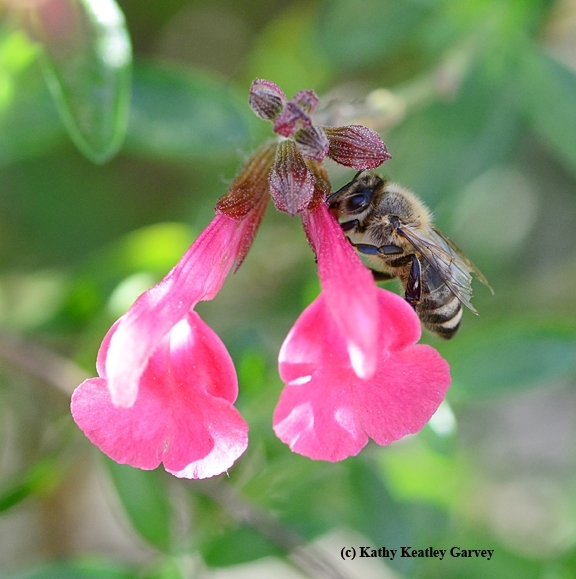 They drill a hole in the corolla of the flower, circumventing the usual plant-pollinator relationship. In other words, they're “cheating” pollination by "stealing" the nectar. Scientists call this "robbing the nectar." 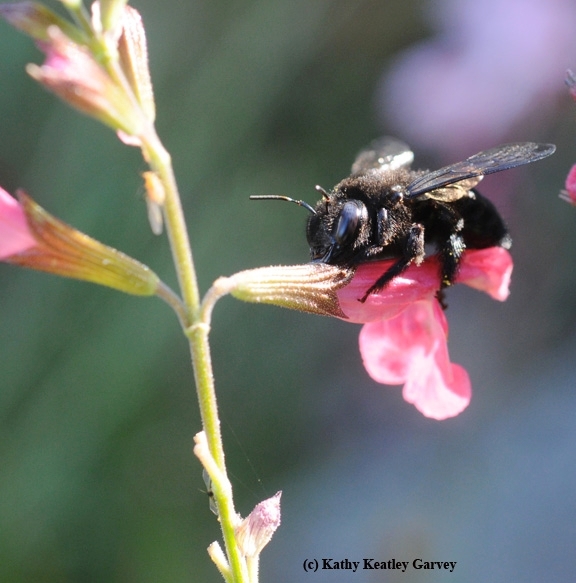 The most prevalent nectar robbers in our yard are the mountain carpenter bees, Xylocopa tabaniformis orpifex. They're better at drilling holes than the Texas oilmen. If you watch closely, you may see a honey bee following the carpenter bee around. She's taking the easy way out, finding the hole pierced by the carpenter bee and then gathering nectar to take back to her colony. If a flower could communicate, it would probably say something like "Hey, you're doing an end run to get my nectar. Please don't use the side entrance--I have a front door." That honey bee has been around the block a few times, judging by her ragged wings. May be older workers get lazier and more inclined to take the easy way out. Carpenter bees are so cool! I've seen them going inside the foxglove more than I have drilling a hole on the outside. Seems like inside is quite comfy! LOL! Maybe they just had me fooled.